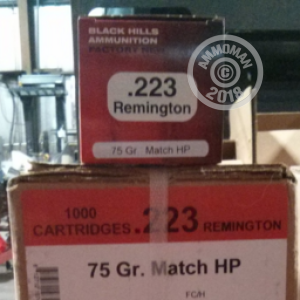 This is .223 Remington Black Hills 75 Grain Heavy Match HP Ammo. These rounds are very accurate and reliable which is why law enforcement agencies across the countries rely on Black Hills ammunition. The hollow point bullets feature a flatter, more uniform, base that increases accuracy. This ammunition is non-corrosive, boxer primed and reloadable brass cases. Black Hills is loaded in South Dakota and provides ammunition to all branches of the U.S. Military. BHA prides themselves on using the best components to produce quality ammunition. Order a case today for free shipping at AmmoMan!